Two interesting posts by Meltzer and Conrad made today. There's a thread where people bash the Bischoff show so bad they're saying they're now mad at Conrad for even doing it. Dave Meltzer wrote: Eric is a man consumed with grudges. Bret ripped him so he'll lie about him out of spite. I was friends with Bryan who wrote a book about him, so he'll lie about me. At a different time his words would be 180 degrees different, For years they were about Bret. His feelings about me are obvious given he and Jason Hervey (granted jason more than Eric, Eric just told me to listen to Jason's offers) tried to recruit me to work for Jason's planned wrestling web site long after WCW went down. Bruce is a con man always looking to get back with Vince and we all get it. He's also smart and entertaining and playing schtick most of the time. I enjoy his show and 90% of the time or more his feelings about stuff in the past are the same as mine, but he can't say it because it kills the gimmick. Eric is just a bitter loser. Very different. That said, Eric's lies about Bret's contract really aren't that different than Bruce claiming the XFL didn't lose money or that crazy Big Bossman story. I enjoy different perspectives and debating them. Unfortunately in both cases, this isn't that at all. Conrad Thompson wrote: 1 - I call BS on nearly every episode. I don't need to respond to the "half way decent host" comment as everyone knows the success my shows have enjoyed. Even you listen despite saying the shows are with a subpar host and feature "con men." 2 - I had hours and hours of research with a format in a certain direction. I had details about those topics at my disposal. I didn't have the Prodigy chat as "Exhibit A" at my finger tips or of course I would have called him on it. I've done this with Bruce dozens of times. Why would this be any different? 3 - What exactly is our "con"? Are you paying for the show? Literally asking a question - do you even know what that word means? We're trying to make you believe something false so you'll give us your money and/or possessions? Where and when did that happen? This is entertainment (and it's free). All of my podcasts are entertainment. They're much more enjoyable when you don't assume that I'm a journalist, which I've never claimed to be. But you clearly don't have the capacity to understand the difference between WOL and Something To Wrestle or for that matter, the meaning of the word "con." 4 - Don't have the courage to call someone out? I do that on a regular basis. You're clearly a troll with that non-sense. Go listen to WrestleMania IX where Bruce and I are shouting about "why" Hogan left with the title. Even this past week I was hammering Eric about "not caring" and fishing so he could just blame everyone else. He dumped on Dave for never promoting and I said, "Dave never lost seven million in a month" or something similar. 5 - You're splitting hairs, like trolls do, about the "roasting before we tape the next episode." Everyone who listens to my shows knows we "follow up" on whatever the prior week's topic was before we start the new topic. That's what I meant - "next episode" means "next topic." We're covering the DX invasion this week and before we get to that, I'm hammering Eric about the Prodigy chat. Those are his own words from 1997 that refute what he said two weeks ago. In this same thread I explained exactly why it wasn't addressed this week (already in the can). But the idea that I would "roast Eric off air" and not do it for the audience to enjoy is beyond silly for someone who has listened to any of my shows before. We always follow up. Appreciate you listening and your feedback, regardless of how silly it may have been. Is Conrad's reply to Meltzer or somebody else? Sorry not to make it clear. They're both responding to the general focus of the thread that people were dissecting Bischoff's lies and pointing out proof of them (namely examples of the times Bischoff said he did offer Bret the big 1996 deal) that Conrad didn't hit him with. Also talking about why Bruce lying comes across as silly and Bischoff lying comes across as vindictive (which was more what Dave was addressing.) 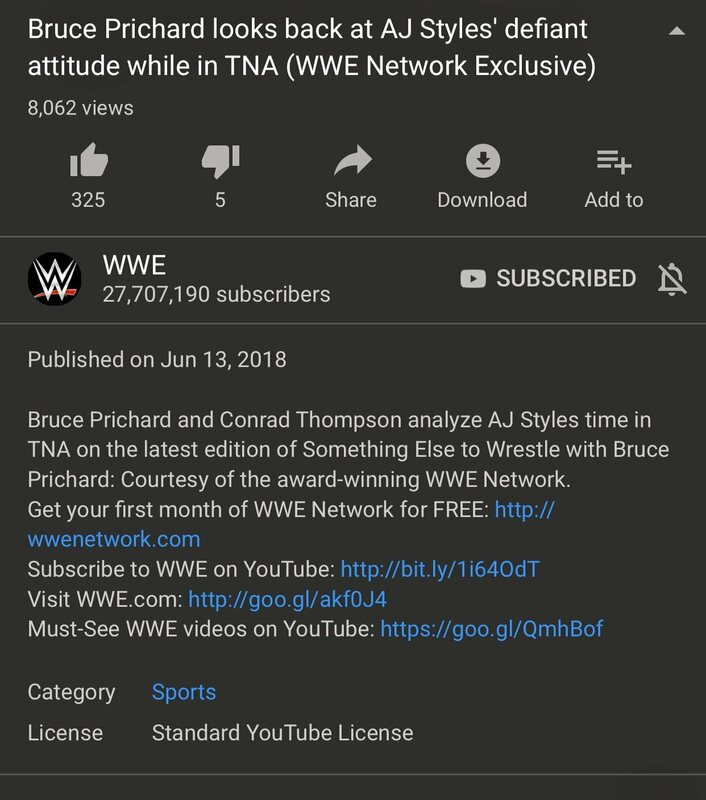 And while Dave did use con to describe Bruce, Conrad was addressing someone else saying 83 Weeks and STWW were "just cons to get Bruce back in WWE and for you to sell t-shirts." High quality Photoshop work by Uncle Eric. They're not the snitches, the ones in the business talking to them to give them stories are. I love it when Bret buries people. He's so thorough. Claire Lynch on the WWE Network. She's finally made it! They did this show to remind him as much as he dislikes an angle all about being punched in the balls it could be worse. That angle was so terrible. Let me guess, Russo wrote it? Wasn't he writing the show in secret up until quite recently? I think TNA even made up some story about him leaving but he never did? Bizarre! Russo quit during the Hogan run in 2010 and came back for less than a year in 2012. He was fired again when they were exposed for secretly re-hiring him against Spike Network's wishes since they knew he sucked. He also pitched Piper vs OJ at Wrestlemania 12, and Piper wanted to do it and planned to shoot on him. But OJ turned it down. Live gun and hand grenade?!!! I'm assuming this was pitched in WCW, imagine Vince's face if that was pitched to him. Piper shooting on OJ would have been crazy too. Enzo on Stone Colds podcast.